Scubazone is a 5 star PADI IDC centre and have been teaching people to dive for over 12 years. Every member of the team is a dive instructor, so no matter what your question - these are the guys to ask! Whether you are new to diving or a seasoned hand, Scubazone can help make your diving more enjoyable with a range of courses from intro dives to instructor level. Scubazone has access to fabulous heated pool in central London to complete the confined water in comfort. Courses can be taught in groups or individually to suit your needs. A new course starts several times a week so training can fit into your schedule. Corporate days, school events or youth group outings... Scubazone can put together the perfect diving experience for any level or group. The shop is large with a great range of equipment on sale. 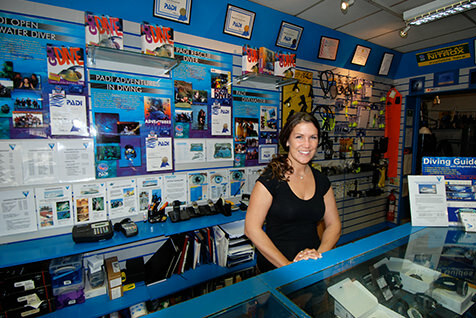 All major brands are sold including Scubapro, Tusa, Aqualung, Mares and Diverite to name but a few. Let this knowledgeable team help you find the right kit! Not sure if you want to buy yet? You can hire kit for UK or overseas trips. Air and nitrox fills are also available. The Scubazone dive club meets monthly for a chat and to plan their next diving adventures. Active in UK waters and overseas, there is always a dive on the horizon with this fun loving club. So no matter if your dream is to dive at home or in foreign climes like the Red Sea, make Scubazone your first stop in London!